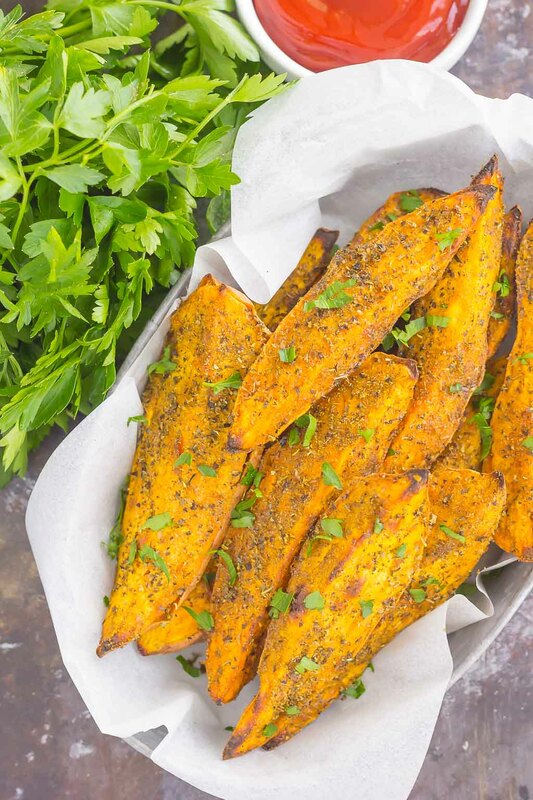 These Garlic Herb Sweet Potato Wedges are loaded with flavor and baked until crispy and golden. 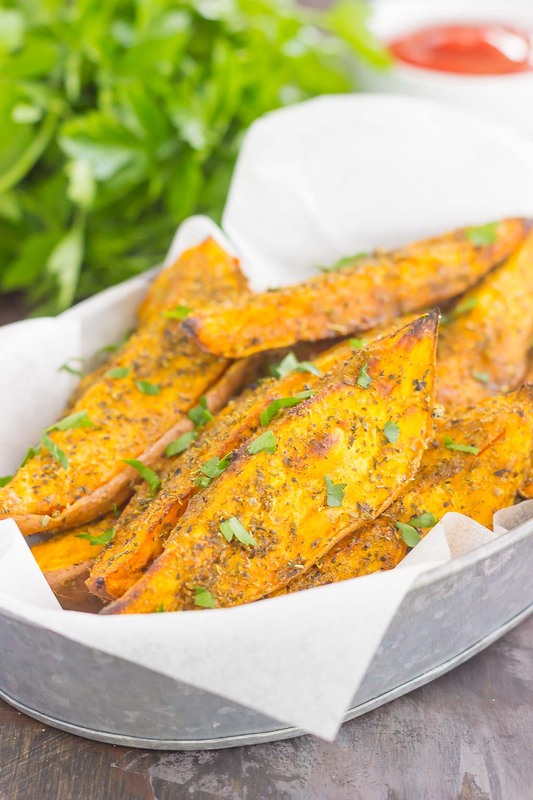 Made with just a few simple ingredients and ready in no time, these wedges are the perfect side dish for just about any meal! Baked, roasted, and full of flavor. That’s the only way that I will eat sweet potatoes. I’m not ashamed to admit that I just started to like sweet potatoes within the last few years. But, I’m picky about them! The casserole or mashed kind just doesn’t do it for me. And don’t get me started on those little marshmallows! I need my sweet potatoes to loaded with flavor, like these Roasted Maple Cinnamon Sweet Potatoes or those Parmesan Herb Sweet Potatoes. And if they’re baked, preferably like these Loaded Twice Baked Sweet Potatoes. See what I mean? I know sweet potatoes can be eaten year round, but this veggie just reminds me of cool, fall days. 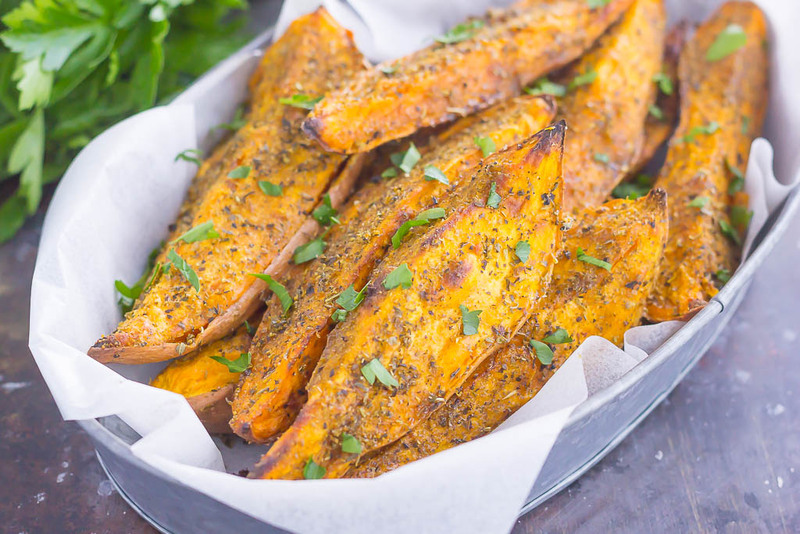 So I thought these Garlic Herb Sweet Potato Wedges would be perfect to share today. Although it’s not exactly cool yet around Chicago, I know those days will come quickly! If you remember these Baked Garlic Parmesan Wedges from last year, then you know I’m a wedge lover for life. And garlic. Just incase you haven’t noticed by now, 90% of my savory recipes contain garlic. It’s pretty much a given in my kitchen. And after testing my cooking skills with roasted sweet potatoes and twice baked sweet potatoes, it only seemed natural that I make these Garlic Herb Sweet Potato Wedges. They’re healthier than the restaurant kind, so easy to make, and so flavorful! Even non-sweet potato lovers (like the hubster) just couldn’t resist these! Plus, you can customize the spices depending on your tastes. I loaded this wedges with garlic (of course) some Italian seasoning, and dried thyme. It makes the most delicious herb-y combination! 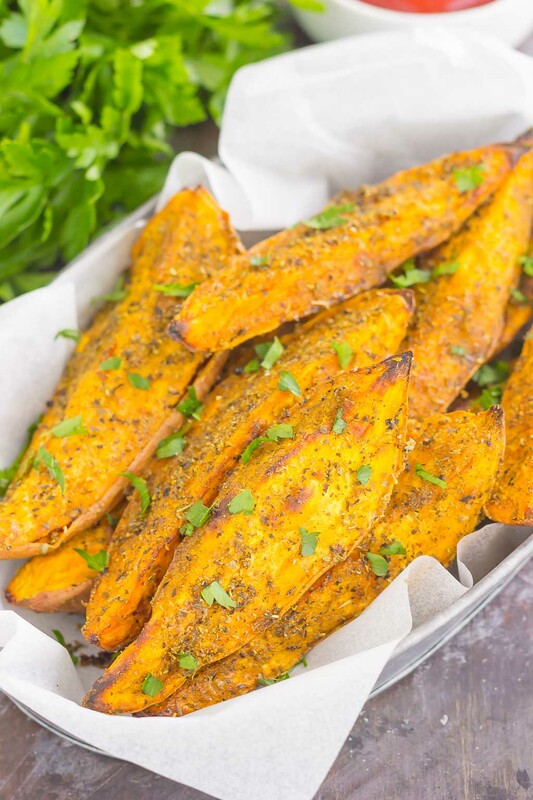 So if you’re looking for a new and easy side dish, these Garlic Herb Sweet Potato Wedges will hit the spot! Preheat oven to 425F. Line a large baking pan with parchment paper. Set aside. 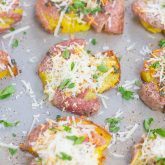 Place potato wedges in a medium bowl and toss with olive oil, making sure each wedge is fully coated. Place each wedge onto prepared baking pan in an even layer. Set aside. In a small bowl, combine the Italian seasoning, garlic powder, salt, and thyme. Sprinkle mixture over potatoes, coating each one evenly. Bake for 25-30 minutes. Then, turn on broiler to medium setting and broil for 4-6 minutes, or until lightly browned and crispy. 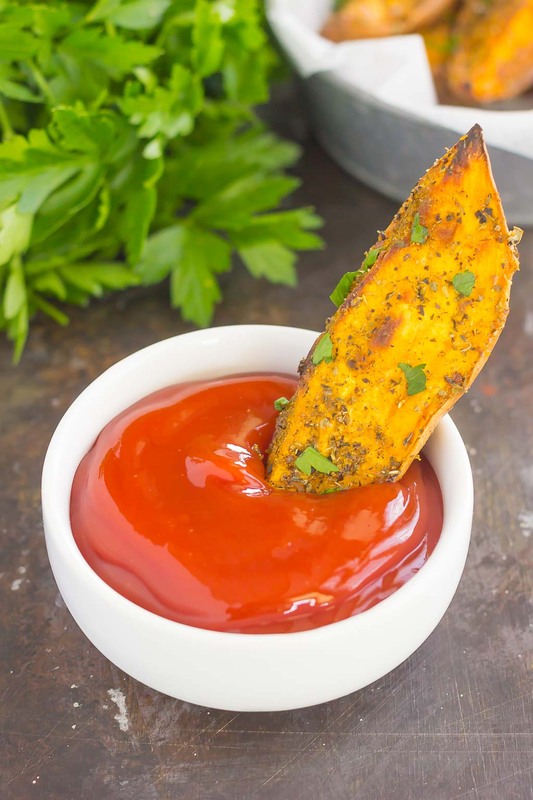 Sprinkle wedges with parsley and serve with ketchup, if desired. Perfect timing! I just got a bunch of sweet potatoes from my neighbors farm, and they're stashed in my fridge with no particular use in mind. I need to try this recipe! This would be the perfect recipe to try! Thanks, Blair! I love garlic too and use it alllll the time! I've always enjoyed sweet potatoes, but never understood the whole marshmallow thing with them. It's just not popular in Canada. Love oven baked wedges like this and could make a meal out of just those...maybe with some garlic aioli? Delish and Pinned, of course. Happy Monday, my friend. Isn't garlic the best? I would bake with it if I could! :) Thanks for the sweet comment and pin, Dawn! I didn't like sweet potatoes when I was younger, but I love them now! However, that casserole topped with marshmallows? YUCK! Seriously, I don't get it. But roasted or as fries - SO MUCH YES!!! These look absolutely delicious, Gayle! Loving the garlic and herb combo! Wish I had a platter of these for breakfast! Pinned! Cheers, friend! Isn't it funny how tastes change? Thanks, Cheyanne! The only way I don't like sweet potatoes is topped with marshmallows -- ugh! I'll pretty much eat them any other way but roasted (or fries!) are my favorites! These look so crispy and delicious and I could definitely eat these every single day! Sweet potato fries are my favorite! I could eat them all day, every day! :) Thanks, Marcie! Roasted sweet potatoes are one of my go to dishes these days...I'll have just a potato with a pat of butter and a sprinkle of brown sugar for dinner. This looks incredible! Loving the herb mixture! Roasted sweet potatoes are the best! Thanks, Annie! These have my name written ALL over them. I love sweet potatoes in any form I can get them. Oh my gosh, these look so flavorful and delicious!! 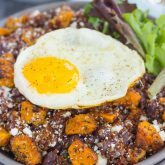 It took me a LONG time to start liking sweet potatoes, but now I'm obsessed! I love them so much. And I think this recipe would make me love them even more! Thanks, Sues! I'm kind of obsessed too, especially when they're baked or roasted! These look perfect! Love roasted sweet potatoes (I also like them fried, but rarely have them)! This seasoning sounds so delicious. Definitely going to try them! Thanks, Mira! I do love sweet potato fries, but roasted kind is a favorite of mine, too! 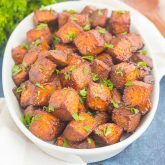 I adore sweet potatoes, these sound so good Gayle! perfect to munch on.. I love a good pile of sweet potato wedges, so this is perfect Gayle! Fall and winter always have me eating a bunch of sweet potatoes.. now we just need some fall weather! Thanks for the sweet potato love, Keri! Lol! I put garlic on everything! I love it too :) These look SO loaded with flavor Gayle! I don't have thyme. Would they still be good without it? Hi Tanya! Absolutely! You can still make these without thyme or swap in another spice if you would like. Thanks for stopping by and I hope you love these!